So here is our studio project description for the semester. All the other integrations studio are designing office buildings (sans Professor Rose's addition of residential program to supplement). Rectangular urban infill site for a big rectanglely building. As far as integrations go, maybe that would be easier though? If you don't know who Nathan Bedford Forrest is, do some research. I didn't until this semester, but in the South (more so in primarily rural areas) he was quite influential and still considered a hero by some. Point of information: Nathan Bedford Forrest did not found the KKK. Who knew the film Forest Gump wasn't 100 percent accurate??? The U.S.S. Undine was a union gunboat during the U.S. Civil War. After seeing action on both the Mississippi and Tennessee Rivers, the Undine was captured by confederate forces under the command of General Nathan Bedford Forrest on 30 October 1864.. After brief duty as a confederate ship, it was scuttled to prevent its recapture. Since the discovery of the wreck of the Undine significant interest in raising the artifact has developed. The non-profit Raise the Gunboats is currently working with the United States Navy and the Tennessee State Park system to find a permanent home for the ship. The raised and conserved remains of the Undine are the centerpiece of this project. Reception and Lobby – 500 s.f. Curatorial and Conservation Space – 500 s.f. Director’s Office – 200 s.f. The Boat Room – A large room for the display of the U.S.S. Undine. Minimum dimensions of this room are 200’ x 60’ x 25’ high. This room should protect the remains of the ship while also providing a comfortable place for visitors to view the Undine. site. 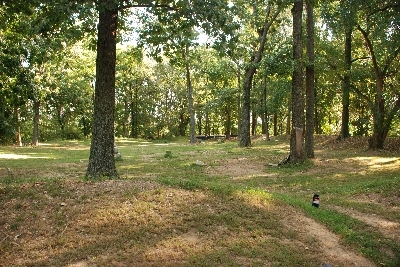 view of Union redoubts which remain in landscape from Battle of Johnsonville. Must remain untouched. Ha. I am not so sure he is a hero anymore. More like a bigot. Where are you from? I actually am from Nashville, but am in school and teaching in Houston. If you go to Nashville ever, there is a huge Nathan Bedford Forrest statue off of I-65 in Brentwood-it was built by "the sons of the confederacy" which seem to be another group of bigots...but don't quote me. How is UT? I almost went there in undergrad, but came to Texas instead. Make sure to include some work examples to show everyone what you are up to. Thanks for representing Tennessee. UT is going wonderful. Only four more semesters - scary. I keep forgetting that I am "supposed to" get a job at the end of all this. I will not however simply take one or the other extreme view of General Forest. I do not know much about the man and will not pretend that I do. Hopefully this project will be an opportunity to better understand who Nathan Bedford Forrest was and what the lasting impact of his actions (during and after the Civil War) mean in our present era. Whether you like him or not - I think we all can admit he was quite influential.